Do you ever wonder where dark money comes from? A press release issued by dangerous warmonger ex-Ambassador John Bolton said the John Bolton PAC will contribute a total of $10,000 to Martha McSaly’s 2018 campaign. Bolton, age 68 of Baltimore, MD, is a right-wing Fox News commentator. 3. 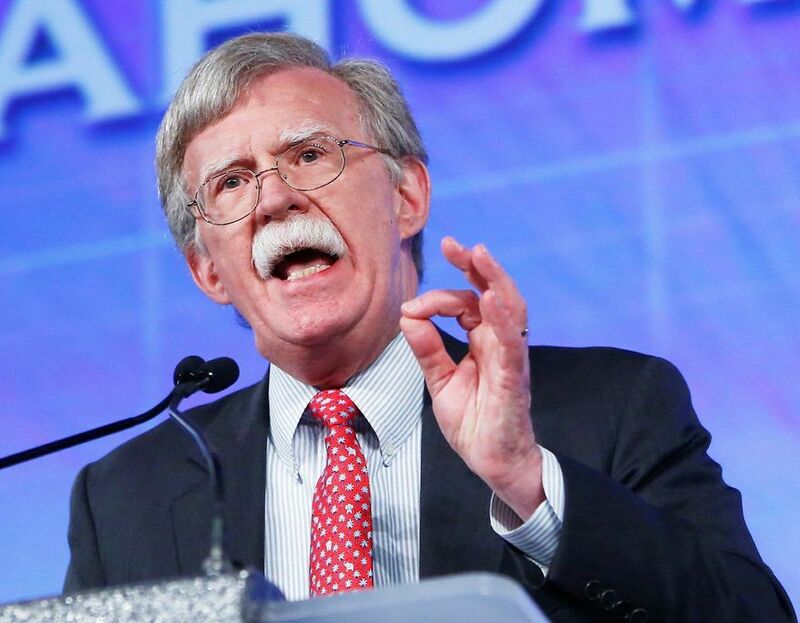 Bolton really, really wants to bomb Iran. 4. President Barack Obama followed Bolton’s terrible advice about Libya, and then Bolton blamed Obama for the resulting mess. 5. 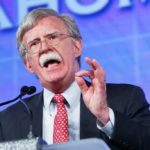 Bolton suggested Israel should unleash nuclear weapons against Iran. In addition to his leadership PAC, Bolton heads the John Bolton SuperPAC, which spent nearly $5 million on three U.S. Senate races in 2016. In the 2016 election cycle, the John Bolton PAC contributed a total of $680,000 and endorsed 94 candidates, making it the most active leadership PAC in the country. This is the earliest the John Bolton PAC has involved itself in an election cycle, signaling Ambassador Bolton’s plans to significantly increase contributions for the 2018 elections. In addition to his leadership PAC, Ambassador Bolton heads the John Bolton SuperPAC, which spent nearly $5M on independent expenditures for three U.S. Senate races in 2016. He rejects the label “neoconservative.” So war monger will have to do. One of Arizona’s worst ousted. There are many more to vote out in 2020. Ha! Ha! Ha! Ha! Ha! Ha! I busted a gut laughing as I read all these disclaimers from a ferocious bunch of people who never served and are now tap dancing like crazy to reassure one another that they are not cowards for avoiding service. But those guys over there – you know, the people we hate – now THEY are cowards for doing the same thing. We did it honorably and with noble intent, but they, they did it evilly and with malice toward the Nation. It is absolutely hilarious watching you all tap dance so fast and furious trying to differentiate what you did (or didn’t do) from the same thing that Trump, Bolton, and Cheney did. And you even had to take a gratuitous swipe at Bush who did serve as a fighter pilot, albeit not to your satisfaction. I really need to tell you guys that this is an area you should stay away from. None of you has a whole lot of credibility for name calling in this arena. Just laying out the truth about your conservative “heros”. Apparently you see nothing amiss about those who were such staunch supporters of the Vietnam war yet went to great lengths to avoid fighting in it. You can laugh all you want, the volume of your misguided laughter is nothing compared to the derision your comments provoke. And for the record I’m a USN, USAF, & USAFR veteran. Like many I choose not to wear my military service (or religious beliefs) on my sleeve. So regarding that crack about “ferocious bunch of people who never served”, perhaps a sincerely heartfelt apology from you to those military veterans here whose political beliefs you don’t share is in order? Frances, among that crew I was addressing, none had served. That was the whole point. Of course, not serving does not mean you are a coward or you do not love your country or you are not an honorable person. That would be stupid to say. I have no problem with people choosing not to serve. It is not for everyone. Among that group I addressed, though, they were trying to condemn others (whom they hate) for not serving while excusing themselves for also not serving. That is rather two faced, if you ask me. To you, Wileybud, I offer a sincere apology. You have earned the right to do as you please in this regard. I don’t owe an apology to all the other veterans whose political beliefs I don’t share because I wasn’t addressing them. I was very specific about that little group in saying what I said. I don’t care if other veterans have different opinions from me. Bless ’em, that is their right and I am happy to argue issues with them because that is what we do here in America. You are as wrong as you can be. Just because many liberals are not jingoistic flag waving, NRA bumper stickers, Marine sticker fetish heroes doesn’t mean we did not serve. We just don’t have the insecurity to constantly pound our chests like your Battle of the Birmingham bar heroes. I am always turned off by those kind of guys, too. It is amazing how many of those guys turn out to have never served and bought their “battlefield experience” on e-Bay. There are many chicken hawks advocating for someone else’s relatives to fight wars. Bolton was one of worse with Cheney. Ask McBolton of the 23 countries McCain has advocated bombing or invading during his Senate tenure, which one she agrees with. someone should ask mcsalley what she thinks of vietnam war draft dogging chicken hawks who let other people do their fight for them. Make that chicken hawk warmonger. Brave brave Sir John ducked into the Maryland Army National Guard during the Vietnam War. Policy at that time was to keep the National Guard and Reserve units stateside as the draft was supplying sufficient numbers. I don’t think anyone is a coward for not serving, I’m not a big fan of killing people for oil, for example. But if you’re always shooting your mouth off about bombing and killing like Bolton, and Cheney, and Trump, and you are a draft dodger, like Bolton, Cheney, and Trump, then you are a coward. They are people willing to send others to do what they are afraid to do themselves. I guarantee if I was in a room with any of those three and I said “boo”, I’d have to give them two for flinching. I agree with you about not being a coward for not serving. Except for those who support the war while ducking the opportunity to serve are cowards. John Bolton falls into the latter category. As does Cheney, Trump, Romney (who thought it more important to proselytize in Paris); and Bush the Lesser whose parent’s friends were able to jump him to the front of a long line of applicants waiting to get into the Texas Air National Guard. A commitment he failed to completely fulfill. I’ll tell you what, Tom, and you can take it to the bank: You are one tough, ferocious pencil pusher!